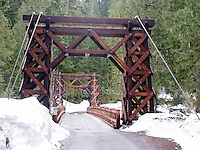 At the Longmire village in Mount Rainier National Park this bridge can be found providing a crossing of the Nisqually River. The bridge provided the only access to the park from the southwest when the Nisqually River flooded in November 2006 and closed the normal route out of the park. It also accesses the Longmire Community Center across the river from the village.